Recently published books of Irish and Irish-American interest. 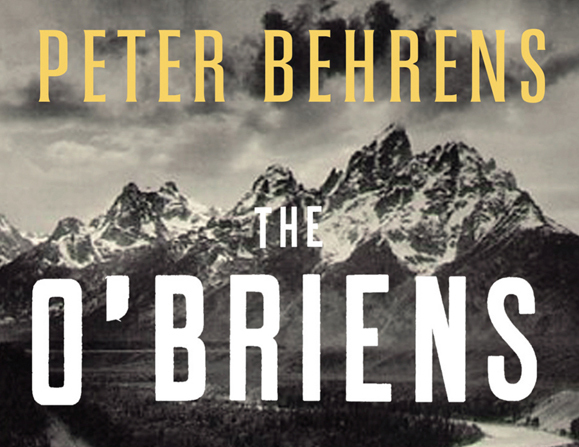 The O’Briens is the long-awaited second novel of Canadian author Peter Behrens, whose debut, Law of Dreams, captivated readers in 2006 with the story of Irishman Fergus O’Brien’s grueling journey to escape the Great Famine. The O’Briens marks a return to the family’s saga but skips a generation, with Fergus’s grandson Joe as the protagonist. He is the eldest of five siblings growing up in 1887, in the forest of north Quebec, and has had no choice but to become the head of his family after his father’s death in the Boer War. Early on, Joe displays a great talent for business, starting his own logging business and employing men three times his age. When their mother dies and their waste of a stepfather crosses the line with their younger sisters, Joe and his brother Grattan quickly make plans for themselves and their siblings. The two girls and their younger brother join the nuns and the Jesuits, respectively, while Grattan heads to California and Joe sets out to make his fortune building railroads. Throughout The O’Briens, Behrens flits from one period in time to the next, from one character’s perspective to another. In 1912, in Venice Beach, Joe meets Iseult Wilkins – also French Canadian and also an orphan. They find something each was missing in the other and wed quickly. The next five decades of the novel take us from California to railway camps in the Canadian wilderness, from an imposing Montreal mansion to a peaceful dinghy making its way from Maine to Cape Breton. We see Joe and Iseult’s family life evolve – strained and then repaired, and damaged again when WWII breaks out, altering their own lives and the lives of their children, Michael, Margot and Frankie. Through the children’s perspectives, we learn far more about Joe than we do when the narrative makes us privy to his thoughts – his sternness and his distance, his cloistered bouts of drinking, and his tenacity to see the best for his family. Though the disclaimer at the end of the book states otherwise, Behrens has revealed that Joe O’Brien was based on his own grandfather, whom he didn’t know well but was always fascinated by. In The O’Briens, he has rendered him fully. In My American Struggle for Justice in Northern Ireland, Fr. Sean McManus tells an important and highly personal account of his years of lobbying and non-violent protest on Capitol Hill in his mission to achieve justice in Northern Ireland. McManus, who founded the National Irish Caucus in 1974 and played a crucial role in seeing the MacBride Principles passed in Northern Ireland, gives insight into how his upbringing, family and early years as a Redemptionist priest set him on his journey to the U.S., and provides a detailed look at his work, the allegiances he made and the obstacles he faced in American politics and in the Irish-American community. McManus was born in 1944, the tenth of twelve children, and was raised on a farm near the village of Kinawley, two miles from the border. As he explains, “The historic parish of Kinawley is actually divided by the British-imposed border. So I grew up extremely conscious that the British government had not only partitioned my country, but also my own ancient parish.” In 1958, at fourteen years of age, he lost his older brother Patrick, who died transporting an IRA bomb that exploded prematurely. Ultimately, the full force of McManus’ outspokenness gained attention and saw him pushed out of Britain by the Church. McManus tells how, once in the U.S., inspired by leaders like Martin Luther King, Jr. and Mahatma Gandhi, he developed his philosophy of non-violent protest: “Unless you resist, you are not practicing non-violence,” he writes. “If you close your eyes to injustice and violence – as so many Churchmen do – you are not being non-violent: you are being cowardly, lazy and indifferent to human suffering.” He takes the reader through the ways in which this philosophy served him throughout the late ’70s, the ’80s and the ’90s. For those who know McManus’s story, his thorough account will give new details and new angles from which to consider this important time in Irish and Irish-American history – particularly the inter-personal conflicts between the different parties involved, which Fr. McManus does not shy away from discussing. For those who aren’t as familiar, it will provide a thorough entrée into his remarkable struggle and accomplishments. Megan Smolenyak is without a doubt the most interesting and intrepid genealogist working today. In Hey, America, Your Roots Are Showing, Smolenyak discusses her many genealogical adventures – from figuring out the identity of the real Annie Moore, Ellis Island’s first immigrant, to her much publicized accomplishment of tracing President Obama’s Irish roots back to Moneygall, Co. Offaly. Smolenyak takes care to provide the facts and dispel the myths about her field of work. Navigating around the current obsession with which celebrity is an 8th cousin once removed of another famous person (which she points out doesn’t mean much) Smolenyak opens with a chapter on her efforts to identify missing soldiers from WWII and the Korean and Vietnam wars. Though she later delves into some of her most fascinating celebrity cases (figuring out Michelle Obama’s family tree when it had stumped so many others; hurriedly tracing Hoda Kotb’s Egyptian roots before an appearance on Good Morning America; determining that Rev. Al Sharpton’s enslaved ancestors were owned by the family of segregationist Senator Strom Thurmond), Smolenyak also emphasizes the stories of average Americans, which she claims to be the real beauty of genealogical research – remembering those who might otherwise be forgotten. Her work is fascinating, and far from overly technical; her conversational style is a delight throughout, like that of a brilliant and charming genealogical detective. Women of Irish heritage have persevered throughout history. It is fascinating to think where the Irish and Irish Americans would be today without the strength of Irish mothers to lead their families. But Irish women are not only mothers; they are also business women, teachers, writers, friends and sisters, often wearing many hats at a time. Cousins and co-authors Patricia Connorton Kagerer and Laura Prendergast Gordon’s new book Wise Irish Women tells the true stories of inspiring Irish women, both past and present, who come from different backgrounds and pursue various lifestyles, but who are all united by their common “Irishness” which helps them to succeed. Wise Irish Women is surprisingly moving. Every woman in the book has something different to shed light on, a new lesson to teach. Granted, some women stand out more than others. The story of how acclaimed author Mary Higgins Clarke became a writer is awe-inspiring. But the way in which her Irish heritage helped motivate her is also reflected in the story of Eileen Lynch, a widow who struggled to raise four children on her own. Every story does its best to “inspire the Irish spirit” and readers who pick up Wise Irish Women will feel this heartwarming effect. Cloaked in mystery but rich in mystical nuances, Kevin Fox’s Until the Next Time is a transcendental tale about the past, present and future of Sean Corrigan, a 21-year-old Irish American who embarks upon a life-altering journey after receiving an unusual birthday gift from his father: the journal of his deceased uncle, Michael (an uncle Sean never knew existed). It unfolds that Michael, a New York City cop, fled to Ireland to avoid being executed for killing a man. On a quest to prove his uncle’s innocence, Sean goes to Ireland, following in Michael’s footsteps. The places Sean visits, the people he encounters, and, most importantly, the journal itself, offer clues to Sean’s own past and future, and reveal just how interwoven his life is with his uncle’s. The journal also reveals a timeless love story and becomes Sean’s key to finding the woman he’s destined to be with. Until the Next Time is a suspenseful story that will both intrigue and confuse you. If you don’t pay close attention, you might get lost in the jumping back and forth between Michael’s and Sean’s lives, as the layering of the characters makes it hard at times to keep track of who is who. Nevertheless, Kevin Fox’s novel will draw you in and keep you there. The people of Galway portrayed in these pages range from famous residents like the Saw Doctors, Tommy Tiernan, and Druid Theater director Garry Hynes, to the firemen, librarians, hospice workers, publicans and shop owners who keep the town running on a daily basis. There are the local fixtures who have lived there for generations, like the Kenny family of Kenny’s Books, and those who came from far away to make Galway their home, like Dan Rosen (featured on the cover), a New Yorker who runs a popular doughnut stand and makes his own clothes. Each person is pictured in a place of some special significance throughout Galway and its environs, and each photograph provides quiet insight into its subject. It must also be noted that Tribe is a prime example of the rare self-published book that looks, feels and reads as if it had a whole team of professional designers and editors behind it. This is a beautiful book in every way. I’m not entirely certain that Peter Behrens’ The O’Briens, is entirely reflective of any Irish, other than being the sequel to a The law of dreams, which had everything to do with the hardships of the Irish potato famine. Still, in an interview http://bookreportradio.com/interviews/Peter%20Behrens%20Interview%20WEBSITE.mp3 Behrens is very much part of the Irish clan that came to America. I really liked the book, and I only wish that I had know of the Law of dreams before I read The O’Briens.